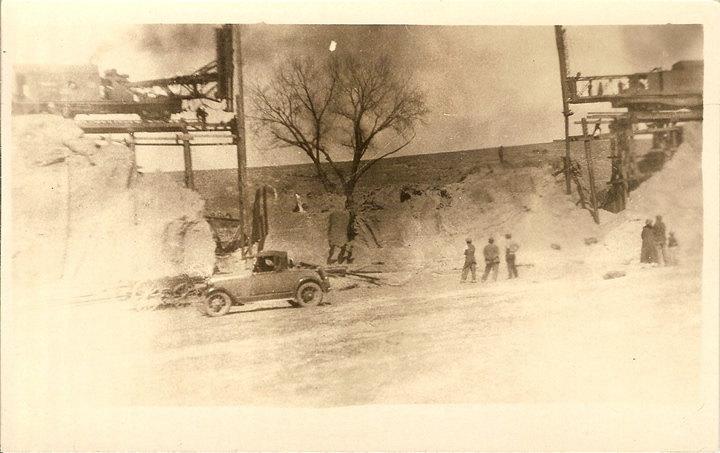 Wednesday marked a day of perfect horror in the hearts of Farnam pioneers when they arose to view the vast destruction wrought during the night by Flood waters that tore and surged through this vicinity, causing estimated damages which scored well past the half million mark. Tuesday evening heavy formidable looking clouds gathered in the south and at 5:30 began to rain. A light shower fell and then a lull followed to be backed up later by a hard rain which lasted from 8 to 11:30. It was accompanied by a rolling rumble of continual thunder and lightning and a hard wind which traveled at a velocity that brought constant fear and worry to those who dread such storms. Only 1.60 of an inch of moisture fell here, so it was generally considered just a bad electrical storm, and possibly a heavier rain farther north, until about 12 o’clock wild cries from the south part of town told that Plum Creek had overflowed the banks, and the valley through the south part of town was one vast sheet of surging, wicked water which swept and tore everything in its path to destruction. The waters from a 10 to 14 inch “water spout” which poured in the community about 10 miles northwest of town, had reached the main creek and the drain from the remaining tributaries had brought to Farnam what most of the people believe to be the worst flood in the history of the town. A similar distaster swept the country here about twenty five years ago, but old timers say the waters were higher and more destructive Tuesday night than then. All outside communication was cut off except a private line through Orafino, and by going through this exchange word was sent to Sterling of the condition of the railroads here. Sometime during the morning this line went out and all outside communication was gone. Practically all of the railway was undermined and washed out until it is doubtful now if service can be restored before sometime next week. The same condition extends east to the end of the Farnam section, and on past Eustis. The passenger got up that far Tuesday morning, and the road east of there washed so badly that they were unable to return to Holdrege. The road is reported to be in about the same condition on west of here. Men were sent out over the line in both directions and reports were returned that about 200 feet of grade was out near the Kitchen farm east of town, and a 50 foot fill over a 150 ft. grade between here and Ingham was totally taken out, leaving the tracks suspended high in the air. The tracks Wednesday morning was one tangled mass of weeds, rubbish, wires, hay stacks and other debris. We also understand that an 8 inch rain fell at Dickens and 12 inches at Moorefield, so in all probability the railroad suffered heavy loss that far west. The small foot bridge across the creek by the power plant was totally demolished and the bridge near the west elevator was left across the railroad track down near the east bridge which crosses the creek to the south in the east part of [t]own, and the bridge one half mil[e] east of town was also taken out. It was necessary to move three families, Lewis Maurers, Reigges and Jess Buckinghams, from the south part of town, and the homes of Reigge and Maurer were washed from their foundations. The small dwelling near the Hathaway property in the extreme southwest corner was moved out into the main valley about 100 feet. The farm home of “Pick” Heath, who resides about seven miles southwest of town in Deer Creek, was completely washed away, but none of the occupants were injured as they took refuge in a cave when they felt the house moving. The small cabin of Jacob Kauffman was washed away. Jake was in bed, when he heard the water swishing on the sides of his house, he opened the door, and water rushed in about a foot deep. He grabbed the ax and [s]mashed out a north window, and then got on the table, ready to jump the opposite way from which the building went over. It lodged against the first railroad bridge, east of town, and Jake crawled out through the window, onto the bridge, and was rescued by C. R. Tanner, Harold Brown, Ralph Parker and one of the Brouillette boys, who waded out in water and hail waist deep on the railroad tracks. The water rose here in town over the Wilcox & Tingley and Brown Implement yards, and filled the lower rooms and bins at all three elevators. It was two feet deep in both of the oil supply and track buildings, and was up in the power house until it necessitated shutting down the machinery. Water marks yet today show that it was up about four feet around the Reiggee residence. Never before had a storm in the dark of night brot [sic.] terror to the hearts of those who watched the water rise up into the lower business section of town. One woman was heard to say that if she hadn’t known that a promise had been made that another flood woul[d] never descend over all the earth, she certainly would hav[e] thought the second one was coming. The storm was far more destructive in the north of town than here. A hard hail storm hit in through that section causing severe loss in livestock fences and in other way. At 10:30 Wednesday morning drifts three feet deep were still encountered by men who drove out from town. It is also reported that a drift of hail 100 feet wide and 8 feet deep was found this morning about 4 miles north of town. The men were told that at the Eckstein farm 3½ miles north of town the hail was four inches deep on the level the night before Mrs. Eckstein had 19 setting hens to drown on their nests, and we are told that never in the 30 years that they had been there had the water risen so high. In a half mile strip between the C. R. Reynolds and Kostmans east of there the carcasses of twenty nine horses and cattle had been washed up on the banks, mute realities of the horrible devastation wrought by floods. Several farmers, living in the vicinity reported heavy loss of livestock, and in many instances could find no trace of them whatever. Unverified reports from Ingham say that the livestock loss was heavy there, and near the C. M. Heath farm 50 head of cattle were piled up on the banks. W. J. Adkisson was in town today from about 15 miles south of town and says there is carcasses of cattle and other livestock lying along the creek banks as far down as his place. They say that the water in Deer Creek, run from 8 to 10 feet deeper than it had ever been known to run before. It swept all the fences away and trees two and three feet thick, are said to have been torn out by the roots. As later reports reach us, the loss grows greater, and we stand in awe of the mighty hand of destruction that brought crude realities into our community of the vast, wide spread horrors of floods. 10 inches of rain was reported at the Ben Teel farm, nine miles northwest of town, and 14 inches at the old Bill Hicks place just a short distance south. We have been unable to learn to what extent the damages mounted in other communities with the exception of North. Mr. Chrisp, and Mr. Woodward, Bell Telephone men from Gothenburg were over yesterday, and report that it will be necessary to rebuild practically all of their toll line. As the wires and all were gone. Communication was restored about 10:30 this morning. Theron Wiggins lost heavily in fences. We are informed that he hadn’t a piece on the lower part of his ranch, and 1600 head of his livestock was roaming at large and he did not know how many had been killed. As far as the men could see the high banks bordering the 30 mile canal were leveled, and the Valleys had been one vast sheet of water. Losses are so heavy that it is useless to try to estimate damages, over the stricken area. It is impossible at this writing to learn any definite particulars from our sister towns as very little wire service has been completed except to Gothenburg. Harry Woodward of Gothenburg, accompanied by Eldin Roberts left early this morning with a team enroute to Eustis to repair the Bell toll lines. Road and railroad construction work started in earnest this morning, being hindered yesterday afternoon by another .65 of an inch of rain. Note: Above photo is from a Real Picture Postcard, it was not published with the news article. We engaged C. R. Tanner and his faithful little Chevy to take us out over some of the territory covered by the worst of the storm. We went out of town on the county line and encountered hail and trash 2 feet deep in the valley just west of the Velte place, however the Chevy went right thru and then we found the bridges out just east of the Davis home and were forced to go south past Geo. Raders and then west to Alcid Gaudreault’s and back to the County line again. Although Mr. Rader’s place is nearly half mile from Plum Creek and up well too, there are bridge plank and railroad ties way up there in the field. We drove over in the Murphy pasture and took a look in the big fill which washed out also taking some pictures. The washout is 50 feet deep and 210 feet long according to section foreman Benton, who made this report to the officials. After seeing this we decided to drive on into Ingham, even though there had been no cars over the road. We were unable to follow the road all the way and encountered thick mud which came up to the hub in places, but fortunately a wagon had passed in just ahead of us and broke the track or we could not have gotten through. At Ingham we found the railroad tracks twisted so at the crossing you could not get into town. From the crossing at the depot for a quarter of a mile west the track is broke into and washed clear from the grade and one end is swung down the canyon. The other end near the depot and sidings are twisted around the pump house and turned bottom side up. We also took some pictures here. It will [take] a large construction crew several days to repair the damage here. Mr. Benton also told us there was a deep fill washed out between Ingham and Moorefield and still some more between there and Curtis. He also informed us that there was a washout up near Wellfleet, but that they expected to get a train thru from Sterling to Curtis sometime tonight and then they would be ready to work this way from Curtis. The loss of livestock down Deer Creek was also very heavy. In talking with Milo Greenlee and Art Heath they informed us that Art had lost 22 head of cattle and Adolph Miller had lost 50 head or more of cattle and other farmers in upper Deer Creek and Plum Creek lost many pigs and chickens. Wherever the creeks crossed roads or fences, they have washed out the bridges and carried away the fences. The telegraph service to the east was restored here at Farnam about four o’clock this afternoon and reports state that it will be at least 10 days before thru train service can be established again. Postmaster Thompson drove to Eustis this evening and got Wednesday’s mail from the train which is stalled at that point. This being [t]he first mail since the storm.